It isn’t easy being a mother. And it isn’t easy having a mother, especially if you’re a daughter. Therein lies a conflict as old as time itself. For Elaine Lui, the difficulty is compounded by having a mother who, on the surface, exhibits little maternal warmth, understanding, or support. Lui’s mother, aka The Squawking Chicken (a nickname so given because once Lui’s mother started speaking up for herself, she never stopped), is one of those tough love parents who does not think her job description includes succor or platitudes. Rather, The Squawking Chicken wants you to learn your life lessons the hard way. 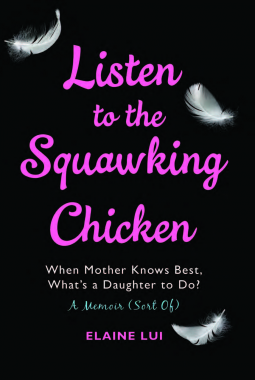 As Lui relates her life as The Squawking Chicken’s daughter, she does so by framing it within her mother’s life. The Squawking Chicken was raped as a teenager, received no respect from her husband during the first half of their marriage, and was forced to return to Hong Kong after a divorce, in spite of having moved to Canada and being settled there. And these are just a few of the trials she had to withstand. With each challenge overcome, The Squawking Chicken learns and remembers. So when Elaine comes along, her mother is determined that she, too, learn life lessons, beginning with this one: life is just not fair. Some of the stories here are heartbreaking, and none of them are heartwarming. But that’s the point. When Lui accuses her mother of abandoning her when The Squawking Chicken goes to Hong Kong, her mother doesn’t so much defend herself – she is not the sort to really care – as she sets Elaine straight. “You think you know everything,” The Squawking Chicken seems to say. “You know nothing.” Lui is a woman, after all, who is expected to call her mother on HER birthday, as well as her mother’s. Lui didn’t come into this world all by herself, you know. She was brought in by The Squawking Chicken. This is not a self-help book, nor is it full of easy platitudes about parenting. Rather, it is an examination of a mother-daughter relationship built on honesty. Unapologetic, occasionally brutal honesty. Just as Lui would not go to her mother for warm, fuzzy bon mots, neither will she parse them out in this memoir (of sorts). As a successful woman (Lui runs the Lainey Gossip website and is a co-host for a Canadian gossip show), Lui is a solid, positive example of her mother’s life lessons. The message here is simple: I am your mother, not your best friend. I know what’s best for you, and sometimes what’s best is not what makes you feel better; it’s what makes you become better.